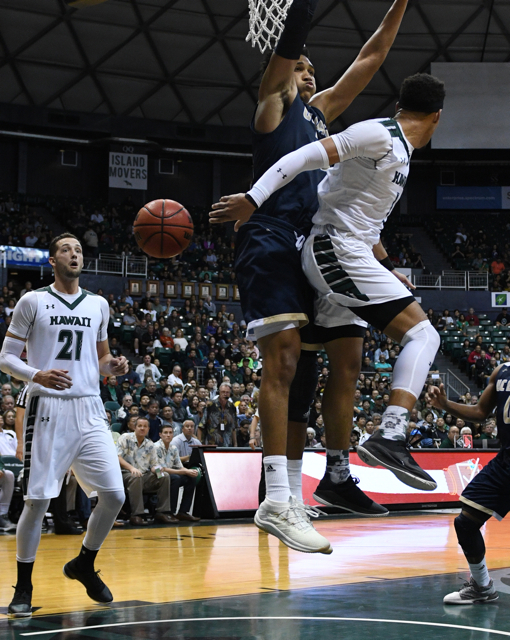 A January 20 home game against UC Davis was one of the high points of the season for the University of Hawai’i basketball team. After a gritty 77-72 win over the Aggies, the Rainbow Warriors were alone in first place in the Big West Conference. A lot has happened in the five-plus weeks since then. UCD is now one of the teams with a clear shot at the regular-season championship in this final week of the regular season, while Hawai’i will wind up in either fifth of sixth. Still, the Warriors can gain much-needed momentum – and throw the top of the standings for a loop – with another upset of the Aggies this week. The teams are scheduled to meet at the The Pavilion in Davis, Calif., on Thursday at 5:00 p.m. (Hawai’i time). It will not be televised, but a live video stream will be available online at www.bigwest.org. 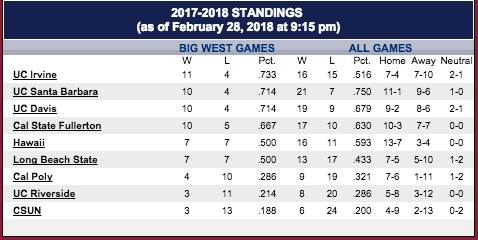 Hawai’i is 16-11 overall and currently tied for fifth place in the Big West at 7-7. UCD is 19-9 and tied for second at 10-4. 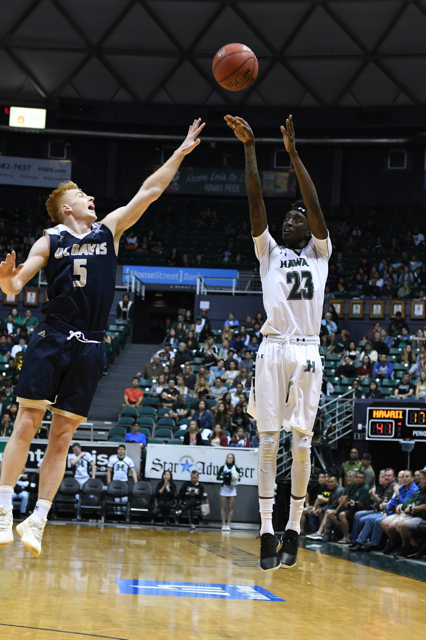 The last time the teams met, Hawai’i was without starting guard Brocke Stepteau (finger injury), but the Warriors still managed to pull out the win with a group effort led by Jack Purchase (21 points, 7 rebounds) and Sheriff Drammeh (14 points). This time, it is the Aggies who will likely be without a starter – and a major one, at that. Chima Moneke, the leading candidate for Big West Player of the Year at the midway point of the season, has sat out the last six games while on “indefinite suspension” for violation of team rules. There has been no indication of a timetable for his return, if at all, although he is being allowed to sit on the team bench during games (but not in uniform). Moneke, a 6-foot-6, 225-pound senior forward, is averaging 18.4 points and 9.6 rebounds per game. He tallied 14 points, nine rebounds and nine turnovers in the loss at Hawai’i. UCD is 4-2 wthout Moneke in the lineup. In Moneke’s absence, 5-foot-9 junior point guard TJ Shorts II has come up big for the Aggies. He is averaging 21.0 points, 6.2 assists and 5.8 rebounds per game, while shooting 62 percent from the field in the six games without Moneke. Siler Schneider, a 6-3 junior guard, is averaging 14.2 points per game, and leads the Aggies with 32 3-pointers. AJ John, a 6-8 junior, has been starting in place of Moneke, and he is averaging 6.9 points and 3.7 rebounds per game. Most of the others in the rotation are role players. The Warriors are led by senior forward Mike Thomas, who is averaging 13.2 points and 6.2 rebounds per game with a .570 field goal percentage. He is the team’s leading candidate for All-Big West honors next week. Drammeh, a 6-3 junior guard, is contributing 11.3 points and 3.3 rebounds per game; Stepteau is averaging 9.8 points per game, and senior forward Gibson Johnson is averaging 9.7 points and 4.6 rebounds per game. Point guard Drew Buggs, one of the leading candidates for Big West Freshman of the Year, is contributing 8.1 points, 3.7 rebounds and 3.7 assists per game. Regardless of what happens this week (Hawai’i will also play at Cal State Fullerton on Saturday), the Warriors will be either the No. 5 or 6 seed for the Big West Conference Tournament, March 8-10 at the Honda Center in Anaheim, Calif.
Cal State Fullerton defeated CSUN, 102-76, on Wednesday to eliminate Hawai’i from a shot at the No. 4 seed. The Warriors’ seeding and opponent for the quarterfinals of the Big West Tournament will be determined after Saturday’s games. Supposedly they’re only 5.5 point underdogs but I’d be surprised if they pull off the upset. My prediction, Warriors will lose tonight but win at Fullerton. Then they will have one win against each team in the league, quite the rare feat! This would mean they could beat any team they face in the tournament, which means the big dance is entirely possible! All depends if this team can come together and get hot at the right time. Let’s go bows! I heard on the radio about all the controversy at UC Davis right now due to Moneke suspension and this being his senior game. I think there’s a really good chance UC Davis will be distracted and UH can swoop in and steal this win. Reportedly, Moneke is done for good. That said, his suspension came a month ago and, quite frankly, Davis has played pretty well in his absence (4-2). Of course, they miss him but he won’t be a distraction as they’ve since adjusted to playing without him. Shorts is someone UH is concerned about as his quickness and baseline-to-baseline speed make him a tough matchup. We’ll see. Ugh. Painful to watch. 21 points on 32% shooting plus 12 turnovers will get you a 15-point deficit at the half.